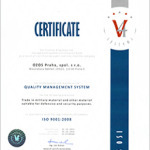 From November, 2006 OZOS Praha continued the process of quality management system according to the ISO 9001 and AQAP standards. 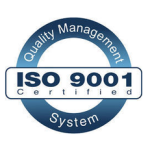 Certification body for quality systems based on positive result of certification audit declares that quality management system has been verified and found conforming according to EN ISO 9001:2008 standards. 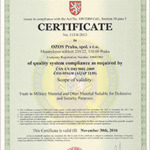 Certification of quality system compliance as required by ČSN EN ISO 9001:2009 and ČOS 051630 (AQAP 2130) issued by Defence standardization, codification and government quality assurance authority of Ministry of defence CZ. 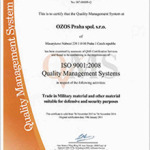 These certificates are not only a proof of the top quality of services provided by OZOS Praha but also a commitment towards its domestic and foreign trade partners. It provides them with an assurance of a professional handling of each and every trade case and confirms the long-time solid position of OZOS Praha as a reliable and experienced partner in the international business.